These days, researchers are telling us that lard from healthy pigs raised outdoors is good for us, saying it's high in vitamins A and D, and mono-unsaturated fats. Some researchers even go so far as to compare it favorably to mother's milk, in terms of its healthy fat content (really). Celebrated chefs are using it, too. I have to point out that the health benefits of lard do not apply to conventional barn-raised pigs. In order to derive any health benefit from lard, the pigs have to be raised outside, on pasture, and preferably organic. This is very important. In our household, since we first came to learn about the health benefits of lard, we've been trying to master the skill of rendering. There are at least two types of lard: the kind that comes from the fat surrounding the kidneys, and the kind that comes from the fat that is under the skin. (There is a third kind, caul fat, to be accurate). This is leaf fat, taken from the kidney area of the pig. Notice the uniquely shaped long strips of fat. The kidney fat produces the highest grade of lard (known as leaf lard), and has the least flavor. When rendered, it's very white. Lard that is used in pastries is generally leaf lard. This is back fat. It comes from beneath the skin of the pig. 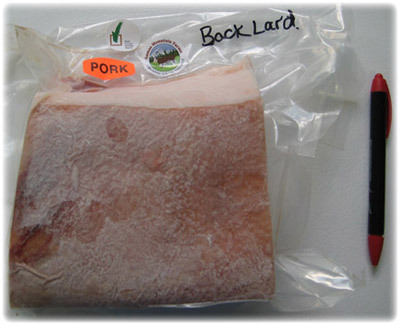 The fat from under the skin is known as back fat, and that's the lard we're talking about today. 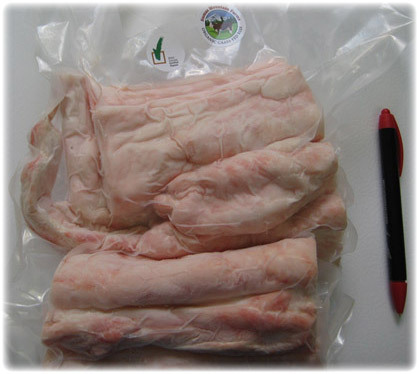 It is less expensive than leaf-fat because there is more of it on a pig. The process of turning the back fat into rendered lard is an easy one --- all you need to do is heat it up. The back fat will melt, giving you rendered lard. The simplest method we've found is to use a slow-cooker. Generally we just put the slabs of fat into a slow-cooker, cover it with a lid, set it to about 200 degrees, and let it go for about 24 hours. Some people add water to the fat during the heating process, as they say it results in a more neutral flavor (less bacon-y taste). As the back fat is melting, we typically take a fork and, every few hours, mash up the remaining bits of fat, breaking up the tissue a little. After several hours, the only thing remaining in the slow-cooker is melted fat (lard), and bits of meat or collagen (from the skin). These are known as cracklings, and (like pork rinds) are tasty to eat and loaded with healthy fat. You can speed up the process by cutting the back fat into tiny pieces before you put it in the slow-cooker. If you have a meat grinder, you can run the back fat through the grinder before putting it all into the slow-cooker --- this would be the fastest method and would result in an abundance of tiny cracklings. If tiny cracklings are what you're after, then cut (or grind) the back fat into small pieces before you slow-cook it. Grinding the back fat before you slow-cook it will give you more rendered lard at the end of the process. If you don't have a slow-cooker, then use the stove-top or the oven, either will work, on low heat. Once the fat is rendered into lard, we let it cool a little (it's rather dangerous when it's hot due to the possibility of splashing on your skin), and then pour it through a fine strainer into glass jars, which we then put lids on and refrigerate. 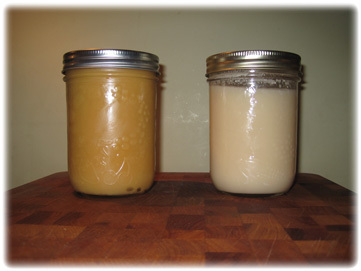 Some people would add cool water to the lard, leaving it overnight in the refrigerator, which will clarify the lard somewhat, and then lift the solid lard up out of the water, dry it off and cut it into pieces. This is what you'd do if you wanted a more perfect result. Now, if you want more pork-flavor in the lard (which you very well may, depending on what type of cooking or frying you intend to do with it), you can put the back fat into a pot on the stove-top, and heat it up for a few hours, then turn off the stove. Next day, do the same. Next day, and next day, and so on. The result is a darker colored lard, with more of a pork odor and a bacon-y flavor. The darker lard has been heated/re-heated several times on the stove top. The lighter lard was rendered in 24 hours in a slow-cooker. We keep a jar of lard in the refrigerator and use it for frying things like sausages and eggs. Anything that needs frying. You can also spread it on bread, or (one of my favorites) is to fry some organic healthy bread in a pan with plenty of lard and then, once the bread is nicely browned, put it on a plate and pour maple syrup over it (we make our own maple syrup here on the farm). Tasty and healthy, at least we think so. The many uses of healthy lard are practically endless, which is why many of our ancestors kept it on-hand at all times. In today's culture, after hearing for so long that fat is unhealthy, it takes a bit of courage and resolve to bring lard back into the kitchen. But, for our family, lard from healthy pigs is a nutritious and pleasant addition to our daily meals.